Spanish Rachel’s Vineyard™ Retreat this weekend. Fortnight for Freedom Begins Today! 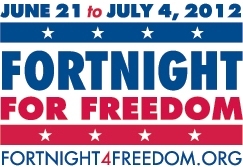 The Diocese of Dallas is joining dioceses nationwide in scheduling events during the "Fortnight for Freedom," a 14-day period of prayer, education and action in support of religious freedom from June 21-July 4. For more information on parish events and Fortnight resources, visit dallascatholicadvocacy.org. The U.S. Conference of Catholic Bishops (USCCB) reaffirmed by a unanimous voice vote on June 13 a recent statement of the USCCB Administrative Committee regarding the HHS mandate. "Cardinal Dolan contrasts true freedom, 'culture of death' in new eBook"
YFL is offering 2 Boot Camps this year for high school students, ages 14-17: Session 1, June 29-July 1 and Session 2, July 27-31. The theme for both camps is Should We Boldly Go Where No Man Has Gone Before? with keynote speaker Rev. Tadeusz Pacholczyk, Ph.D. of the National Catholic Bioethics Center. More info and registration available at prolifedallas.org/bootcamp. How can you save an innocent life? If you feel called to be a prayer partner or a sidewalk counselor, then this training is for you! The training is free, and a continental breakfast, light lunch and all materials will be provided. Pre-registration is required and available online here. As part of its Fortnight for Freedom program, St. Mark is hosting a dinner presentation: What It Means To Be a Catholic American, including how our Catholic beliefs and civic responsibilities intersect and what it means to be a Catholic voice in the public square. Parenting is tougher than it used to be. And if California is any indication, parents soon may have to fight for the right to exercise any influence — not to mention authority — over their children’s sexual behaviors. CPLC Executive Director Karen Garnett on the McCuistion Program on KERA, Ch. 13, this Sunday at 12:30 p.m. Don't miss Karen offering a counter-voice to Planned Parenthood CEO Ken Lambrecht regarding taxpayer funding of abortion providers and contraception under the guise of women's health care. And tune in Monday, June 25, to the Good News on KATH 910 AM at 12 noon for a full pro-life hour, featuring Karen Garnett discussing Fortnight for Freedom events in the Diocese of Dallas and CPLC's Abortion AfterCare-Healing staff Eileen Kulhmann and Lacy de la Garza discussing The Rachel Ministries. Last month dozens of Catholic institutions in the United States filed a lawsuit against the [U.S.] administration, challenging the constitutionality of its contraception mandate. There can be little doubt that requiring employers to provide a drug that violates their conscience is against the First Amendment. It violates one of the main reasons for the founding of our country: religious freedom. Learn more about the Church's teaching on contraception at prolifedallas.org/contraception.